PRAGUE is one of Europe’s party hotspots, especially for young travelers. If you stick to the well trodden tourist path, you are guaranteed to miss out on the true Prague party experience and find yourself with an empty wallet. During the empty winter months, one of Prague’s best kept secret drinking spots is the grounds of the castle, Pražský Hrad. 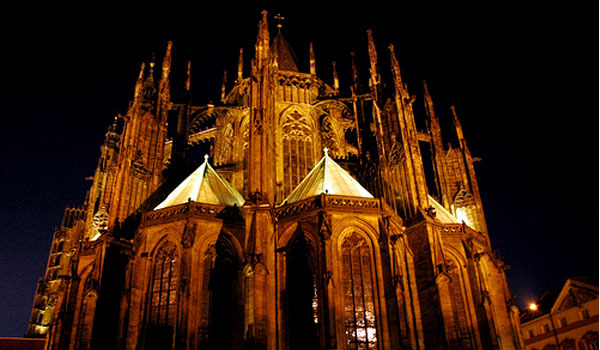 Grab some el cheapo supermarket pivo (beer) or absinthe, and some warm clothing, and head up with some friends to enjoy the beautiful views and spectacular St. Vitus Cathedral. Laws concerning public consumption of alcohol have recently changed so be prepared to be moved on if caught. Accounts of locals indicate these laws are not being strictly enforced and this spectacular spot is worth the risk. Where else in the centre of Prague can you find a busy pub with a great vibe where you can get a pivo (beer) for less than US $1? Atmosphere is cheap and cheerful and is about a two second walk to Five Story Club (featured below). It gets busy though so if you want a table get there early. The sports bars in Prague are generally pretty dodgy, expensive, and cater to drunken English stag-night participants. If you’re looking for a hit of masculinity or just need to catch an important game from back home, Sportsbar Zlatá Hvězda‎ is one of the cheapest and coolest sports bars around and located right in the middle of Prague just near Wencelas Square. It can get pretty crazy. The last time I went there, my friend walked out of the bar with the toilet door and nobody noticed. In the off hours when there is no important game on, the funky underground wine basement is a great place to enjoy a reasonably priced wine or beer. Located among to the student dorms for the University of Economics (VSE), this little gem of a restaurant-bar offers delicious meals and drinks on the cheap. It’s a great place to watch sports, play pool, and drink yourself silly with students from all over the world. It’s also close to Exit Chmelnice, one of the locations for the famous VSE Nation2Nation parties (see below). 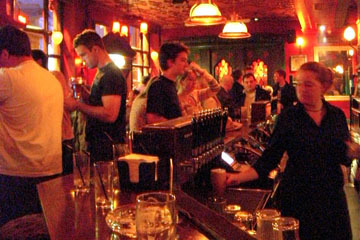 The Globe is a funky hang out that is very popular with the expat crowd. It is a tad expensive but serves delicious food, including a great dessert menu. It has a great laid-back atmosphere and most days, live bands and a half price cocktail happy hour from 5-7pm. Legend amongst international students, the Nation2Nation parties are the hottest student parties in Prague. Run by VSE on most Tuesday nights during the semester, these parties are always at great locations. They are a dependable source for great drink deals and are filled with young travelers, international and Czech students that keep the party going until the wee hours of the morning. To get in as a non-VSE student, just get there early and pay a little extra at the door. Just down the road from Wencelas Square and located in the Lucerna shopping complex, Lucerna Music Bar is a local favourite which hosts Czech bands during the week, and turns into an awesomely cheesy 80s and 90s themed nightclub on the weekend. Popular with locals and travelers alike, this bar is THE best place to go to on a Friday or Saturday night for some old school dancing. Located outside of the city centre in a old abandoned fabric hall, but the time and effort getting to this club is worth it. Club Mecca is usually where all the famous DJs play when in town, and as such drinks and cover are pretty expensive. Drink beforehand to save some cash. Come here to enjoy the chance to dress up in your best party gear and rock out with a mix of VIP Czechs and foreigners. 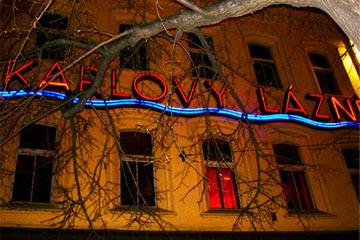 Loud and obnoxious, kitschy and touristy, any avid party-goer in Prague has to see the the infamous Five Story Club at least once. There is a cover charge and the drinks are expensive, but the place makes up for it with 5 different levels of music and outrageous décor including a light-up 70’s themed dance floor. Stop by during the week for a lighter cover and less of a crowd. If you want the full experience you’ll have to come on the weekend when the lines are long, the door price is jacked up, and all five floors are teeming with loud, drunken tourists. Amazing. There is nothing better than a pivo and a sausage from one of the famous Sausage Stands in Wencelas square on the way home from a big night out. The best one is on the corner of Vodičkova and Václavské Náměstí – halfway up Wencelas square, where the trams cross. You’ll have to be quick, though. These famous stands with their tasty sausages are facing extinction thanks to an unpopular and controversial decision by Prague City Hall last year to phase them out. Make sure you grab a taste of history before it is too late! If you are too late, duck into a convenience store instead and grab an even cheaper pivo and a crocodile roll. The ‘croc’ are Czech owned and famous throughout eastern Europe and are an almost-as-good substitute for the sausages. The best flavor? Golf.